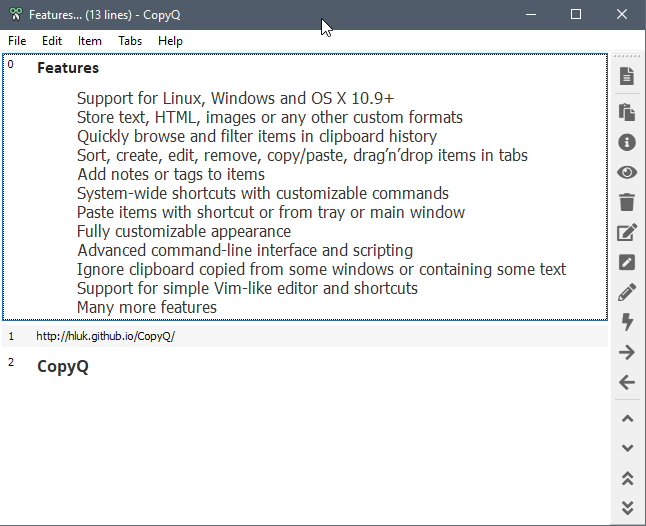 CopyQ is a cross-platform open-source clipboard manager for Linux, Windows and Mac OS X that is easy to use and quite powerful thanks to the advanced features that it offers. 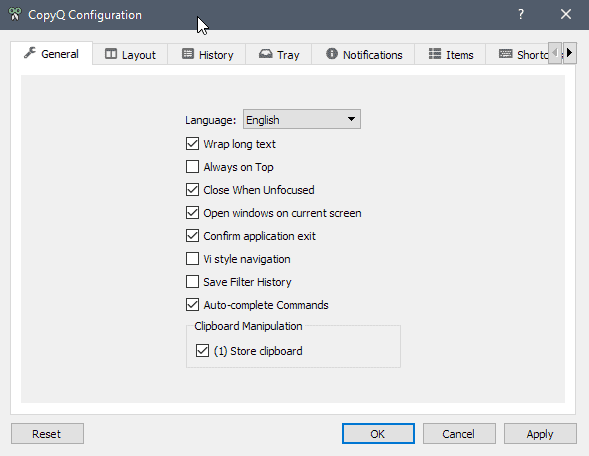 Clipboard managers extend the functionality of the built-in clipboard function of the operating system. The clipboard on Windows is limited to a single entry which means that it erases the previously stored entry whenever a new one os copied. Most clipboard managers remember multiple copied items and many offer additional functionality besides that. Windows users can run CopyQ as a portable program that does not require installation. The program stores anything that you copy to the Clipboard in its interface when you run it. Anything meaning plain and formatted text, HTML code, images, URLs and any plain text type of data. You can access the data at any time and run operations such as edit, delete or preview on copied items. A built-in search is available with a tap on the F3-key on the keyboard to search the data set. While you can use CopyQ this way exclusively, you may also use the program's support for tabs to separate clipboard items. Tabs are useful as you may use them for separation, for example, different work or school projects, or research topics. Since CopyQ saves the data across sessions, you may even use CopyQ for activities such as bookmarking that it is not designed for in first place. CopyQ remembers 200 entries in history by default. You may change the number in the preferences. The program ships with a large set of options and settings. Some change the design and layout of the program, others its behavior and functionality. Add a tab tree and hide various items. Disable the tray icon (so that you use it with shortcuts solely). Change the display format of specific items, e.g., images, text or notes. You may notice that some keyboard shortcuts may interfere with program shortcuts. CopyQ supports advanced features such as sort options for clipboard entries, ignore rules for certain programs, password protection, advanced command line and scripting functions, or an option to sync tab items with files in a directory. A good starting point for these is the official program documentation. The command line options that it provides are quite handy. Run copy q add "text1" "text2" to add text to the clipboard, copyq read 0 to print the content of the first item, or copyq --help to display the available command line arguments. CopyQ supports exports and imports of the history. While that is not a full sync feature, it still gives you options to sync your clipboard data across devices or create a backup of the data for safekeeping. CopyQ is a powerful clipboard manager that works well out of the box. Users who dig deeper get even more functionality and while some of it may seem overkill to most users, it certainly is useful to some. Now You: Do you use a clipboard manager? Martin’s five stars are well deserved in my opinion. I don’t know about the Windows and Mac OS X builds, but the Linux build is by far the best clipboard manager for Linux distributions that I have seriously looked at. I have been using CopyQ for more than three years now and it has gotten better and better. Its “large set of options and settings” is a big plus. There are binary download packages for a number of Linux distributions and there is also a PPA. I use Clipboard Fusion only because the add-on I was using in FF is no longer supported in the latest versions.I very well might try this one as it appears to offer allot of functions that I could use. I use ditto as I can store its database on nas or just allow networked computers to access clipboard if needed. Thanks for mentioning this great program. Look’s to have everything I need from a clipboard manager. If I am not mistaken, CopyQ lacks of the possibility to save/keep the favorite copied elements, as my email adres for example, (but actually has many other strengths). Sounds like AutoHotKey might be what you are looking for, as you can set up hotkeys or custom hotstrings to insert frequently used text, such as your email address – it could be set to a string of “em.” for instance. It is also relatively easy to set up. Using Ditto. I love the ability to search for text in the database of clips. I use CintaNotes already but I will try this one, thanks for the info. Seems nice at first.. with what program I can open the .qm to correct spelling and grammar mistakes in French? Not simple, It seems I can’t avoid to register on weblate… reading legal terms “.5 Personal Data” I will try it keeping its imperfections. Thanks anyway. I use Clipjump for years, but will look at this too. Thnk you. Using Ditto here as well. Thanks for the article, Martin. I have been looking for something like this. I had occasion to use this just the other day. I meant to search for something but got busy with other things. IMO, the most powerful and best clipboard program ever was/is Clipmate (http://thornsoft.com/). I have used this for probably 10 years. It is a small dB program as well as a clipboard manager. I have nearly 17k clips stored that take up about 110MB! But DON’T buy this product because the developer hasn’t released any updates in years, there is no support that I am aware of (developer closed the forums years ago) and he has basically abandoned the product. I only wish that some other developer would examine what he did, copy the functionality, maybe improve on it and then offer it for sale. I would certainly pay for a supported program with all the functionality that Clipmate offers. I originally paid something like $30 for it years ago. AGREE COMPLETELY! I’m still running Clipmate and dread the day it is truly made unusable by some update or other. I’ve tried many other clipboard managers and always come back to Clipmate. Yes! ClipMate was (in my opinion) the best clipboard manager ever, but development ended in 2015. AFAIK ClipMate started to get issues with large volumes of clips and the developer was thinking of v8 ‘some time in future’, but probably he left that idea. Regretfully so. The only recent way I have used multiple clipboards is within IrfanView where you can also clear the clipboaed. CopyQ is going to test my creativity to the extreme once I learn it. Thanks for the tip. I used CipMate for many years but it isn’t maintained anymore and doesn’t get along well with my Windows 10 & high definition display. I looked around for a while and finally discovered Spartan MultiClipboard, which is almost too powerful and should be much better known (20 euros). unfortunate about ClipMate. the one killer feature from ClipMate for me is the ClipMate ClipBar(anyone know of a clipboard manager with a similar feature ?) having your clipboard available on the taskbar is really convenient and this one feature is what is keeping me with ClipMate. your suggestion looks promising, Spartan looks to be very very powerful! thank you for the suggestion. I will take a look at Spartan. Does it capture the URL with the clip as CM does? This is really useful to me as I save a lot of clips and I can always get back to the original clip because CM has the URL. I just use the clipboard manager that comes with KDE. It’s basic, but does what I need. Every time I have to use Windows, it’s one of the things I miss terribly. I should give this a try on that platform! I’ve used ditto with windows for a long time, been using copyq with linux for a year now, very good though has the occasional crash, I’m thinking of switching to copyQ for windows now as it’s cross-platform, both very good products imo.